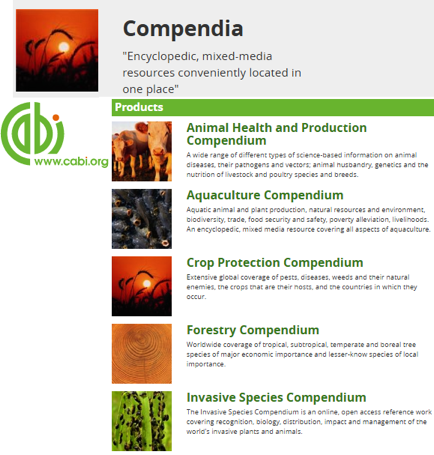 The Invasive Species Compendium is a CABI’s online encyclopedic resource that brings together a wide range of different resource types of science-based information to support decision-making in invasive species management worldwide. Invasive alien species (IAS) “are the second biggest threat to biodiversity (after habitat destruction) and are a major cost to the economic well being of the planet. They cause enormous and often irreversible harm to biodiversity around the world by displacing native and useful species and changing ecosystems". (Introduction To Invasive Alien Species). CABI has been developing and providing Compendia for almost 20 years and has a wealth of experience in collating and editing information, and presenting it through innovative software to provide authoritative tools. 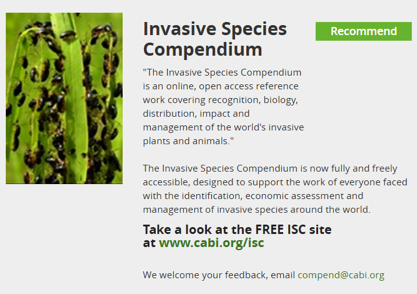 The Invasive Species Compendium (ISC) – one of the CABI’s encyclopedic mixed-media online resources - was fully launched by CABI in 2012 to bring together a wide range of resource types of science-based information to support decision-making in invasive species management worldwide. In particular, the ISC is an online, open access reference work covering recognition, biology, distribution, impact and management of the world's invasive plants and animals. The ISC has been supported by a diverse international Consortium of government departments, non-governmental organizations and private companies. Researchers / Lecturers and students / Resource and environment managers in agriculture, forestry, rangeland, urban land, rivers, lakes and coastal waters / Policy makers, agricultural research centres and Extension officers / Quarantine officers / Crop protection and animal health practitioners (both public and private sector) / Weed specialists. Content of the work whose copyright is owned by CABI is licensed under a Creative Commons Attribution-NonCommercial-NoDerivs 2.0 UK: England & Wales Licence. Any material whose copyright is owned by a third party can be identified by the presence of a ©, by the statement “all rights reserved”, or by other clear labeling of copyright ownership, and are not available under this Creative Commons licence for copying or reuse. Text, illustrations and photos, other than those whose copyright is owned by a third party, are provided free of charge to anyone under the condition that the title of the resource and CABI’s name appear prominently in any copies made. 6,980 Basic Datasheets, 57 Library documents, 1130 Full Text articles, over 780 Glossary definitions, and over 75,700 bibliographic records. In 2014, the ISC was launched on a new web platform which provides better navigation between datasheets and improved searching across all content types (images, maps, datasheets, abstracts, full text, ISC library and glossary). In 2015, a new feature was added to the Country datasheets to export species and animal disease records from both full and basic datasheets into a spreadsheet. Moreover, CABI started development work to provide a new online form to help its contributors write, review and submit datasheets. comprise fully referenced sections on taxonomy and nomenclature, distribution, habitat, identification, biology and ecology, species associations, pathways for introduction, impacts and management, complemented by images and maps, and supported by abstracts and full text articles. priority is given to those included in the list of diseases notifiable to the OIE (World Organization for Animal Health). Over 120 animal diseases and the associated pathogens are covered, with extensive information on diagnosis, epidemiology, economic impact, management and control. contain the same sections as the Invasive species datasheets but our authors have found little or no evidence that they are invasive species. Sample datasheets on habitats are included, providing information on risk of species invasion, impacts and management of invasive species. These datasheets (pathway causes and pathway vectors) give information on the issues and management options concerning invasive species. contain summary information in tabular format. They have been compiled mainly by data mining various sources (including the CAB Abstracts database and selected invasive species databases). Over 180,000 bibliographic records with abstracts and metadata are included in the ISC. This subset of CAB Abstracts includes the references cited in the datasheets and additional recent articles of relevance. Access is also provided to over 3,600 articles in the CABI archive. The Library is a collection of specially selected full text articles which complement the more structured information in the species datasheets. Over 780 terms and their definitions have been compiled from various cited sources. Systematic Review: What is the evidence that invasive species are a significant contributor to the decline or loss of threatened species? New datasheets and data sets continue to be added, datasheets are reviewed and updated by experts, and new scientific literature is included on a weekly basis. All resources draw together scientific information on all aspects of a subject area. They are excellent research tools – saving time for researchers, students and practitioners. Invasive (alien) species; Introduced species (alien, non-native); Native species; (Plant) pest; OIE notifiable disease. Transient: non actionable (the pest has only been detected as an individual occurrence or isolated population not expected to survive). Work is ongoing to harmonize the Compendium taxonomy with the CAB Thesaurus. At present, the CAB Thesaurus continues to follow the Cronquist system of classification for the orders and families of flowering plants rather than the APG III system which which has been adopted by many botanists. to join the Development & Sustainability Consortium to become part of this exciting project. Benefits: a seat at the table to determine strategic direction / financial leverage / certainty of achieving an outcome / visibility as one of the developers / access to the Compendium during development / opportunity for discussion of common interests in an international forum. For further information about membership, please contact CABI by email.